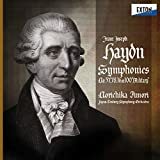 This magnanimous release is a reissue of the successful Haydn Edition, the only substantial Edition on the market today. This release is the extended version, now with 160 individual albums, with the addition and completion of the Masses, the String Quartets, the Notturni, and the opera L’Anima del Filosofo. This release features Award winning performances by Austro-Hungarian Haydn Orchestra/Adam Fischer, Buchberger Quartet, Emma Kirkby, Frieder Bernius, Bart van Oort, Haydn Trio Vienna, and many more. Enjoy the greatest celebration of one of the greatest and not yet fully appreciated composers of all time: craftman and genius, creator of a musical world of wonder, surprise, wit and sentiment, forever to be explored and marveled at. Product description Sinfonia Finlandia Jyväskylä - Patrick Gallois - Northern Chamber Orchestra - Nicholas Ward - Orchestre de Chambre de Cologne - Helmut Müller-Brühl - Toronto Chamber Orchestra - Kevin Mallon... Review With the symphonies, it is a bit of a mixed bag. There is no getting away from the fact that several, especially the early ones, are hastily cobbled together and do not reflect much inspiration. However, even weak tea can be made more palatable with an enthusiastic and imaginative execution. My favourite among the half-dozen ensembles sharing this enterprise are the Toronto Chamber Orchestra ledby Kevin Mallon, with Helmut Mueller Bruehl's Cologne Chamber Orchestra a close second. Yet none of the others even where drawn from Naxos earlier releases is less than adequate, and all benefit from superb reproduction. --Music Web International.